I sit here in Greensboro, NC tired, but inspired after spending all day at the Elliot Center at the UNC-G campus. NCWN held the 2008 Spring Conference here and it is the first time I've attended the annual spring conference. I usually make it a priority to register for the Fall Conferences in Asheville and last November we drove to Winston-Salem. Most presenters for the conference today were on faculty at UNC-G.
My favorite part of the day was the Publishing Panel consisting of Scott Douglas of Main Street Rag, Kevin Watson of Press 53, Jeanne Leiby of Southern Review and a man from the Georgia Review, but I never understood his name. 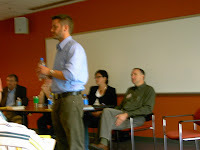 After a short talk by each member of the panel, I realized once again how important it is to know your market. Read the guidelines carefully and follow them. While the writer may not know it, the guidelines are specific for a reason. Douglas said it is a matter of resources. He hires editors to read submissions therefore, he makes it clear he does not want simultaneous submissions. The reason is obvious. After he has paid an editor to read work that he cannot publish because it has been accepted somewhere else, he is out that money with nothing to show for it. I can't blame him. Although Scott has grown MSR into quite a good business over the years since I first met him, he says he still sweeps the floors and binds the books. "It is easier to find a person to read submissions than to find someone to bind books," he said. I didn't know until today that he prints books for a number of other magazines. He is still a rebel in this business and not so snooty as the Georgia Review. Their representative said don't send your poetry to them unless you don't mind letting them "meddle" with it. I got the impression that they "edited" or "meddled" with everything that goes in the magazine. Scott, on the other hand, wants the work you send him to be ready for the printer when he gets it. He doesn't want to have to rewrite or work too much to make changes to a submission. And don't try to make changes after he has it ready to print. Listening to some of the stories they told today made me a little more understanding of the editor's and publisher's problems with writers who are inconsiderate and hard to work with, who won't follow guidelines and seem to have no understanding of how a book is made.. This panel covered everything a writer wants to know about submitting and publishing. I sat in on about an hour of Ed Southern's session on publishing and found a good discussion going there. I wish I had been there for the entire session. Congratulations to Ed Southern and Virginia Freedman for the work they put in to bring us this great conference. Even though they had some challenges, no one knew it and things went off well. I worked with Virginia and Ed at the registration tables and enjoyed meeting the writers, greeting them and seeing friends like Valerie Nieman, Katherine, who was in my JCCFS class in March, and Marlyn who came to Hayesville for our Lights in the Mountains conference and stayed four days. I enjoyed meeting Jan Parker and hope she is reading this blog now. I wish more of our Netwest members would attend the NCWN conferences. They are always interesting and fun.